1. 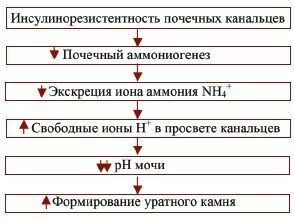 Ramello A, Vitale C, Marangella D. Epidemiology of nephrolithiasis. // J Nephrol. 2000. Vol. 13, Suppl. 3. P. 45-50. 2. Robertson WG, Hughes H. Epidemiology of urinary stone disease in Saudi Arabia. // In: Ryall R, Bais R, Marshall VR, Rofe AM, Smith LH, Walker VR (eds) Urolithiasis 2. Plenum Press, New York London, 1994. P.453–455 . 4. Romero V, Akpinar H, Assimos DG. Kidney stones: a global picture of prevalence, inci-dence, and associated risk factors. // Rev Urol. Vol. 12, N 2-3. P. e86–e96, 2010. 5. Заболеваемость населения России в 2003 году: Статистические материалы. М.; 2004 г. (электронная версия МЗ и СР РФ и ЦНИИ организации и информатизации здраво-охранения МЗ и СР РФ). 6. Заболеваемость населения Российской Федерации в 2013 году: Статистические ма-териалы. М.; 2014г. (электронная версия МЗ РФ и ЦНИИ организации и нформати-зации здравоохранения МЗ РФ) Заболеваемость населения Российской Федерации в 2013 году (статистический сборник, 2014 г. ); URL:http://mednet.ru/images/stories/files/statistika/zabolevaemost_vsego_ naseleniya/2010/zabolevaemost_2014.rar. 7. West B, Luke A, Durazo-Arvizu RA, Cao G, Shoham D, Kramer H. Metabolic syndrome and self-reported history of kidney stones: the National Health and Nutrition Examination Survey (NHANES III) 1988–1994. // Am J Kidney Dis. 2008. Vol. 51, N 5. P. 741–747. 8. Antonelli JA, Maalouf NM, Pearle MS, Lotan Y. Use of the National Health and Nutrition Examination Survey to calculate the impact of obesity and diabetes on cost and prevalence of urolithiasis in 2030. // Eur Urol. 2014. Vol. 66, N 4. P. 724-729. 9. Wong YV, Cook P, Somani BK. The association of metabolic syndrome and urolithiasis. // Int J Endocrinol. 2015;2015:Article ID 570674, 9 pages. doi: 10.1155/2015/570674. Epub 2015 Mar 22. 10. Domingos F, Serra A. Metabolic syndrome: a multifaceted risk factor for kidney stones. // Scand J Urol. 2014. Vol. 48, N 5. P. 414-419. 11. Grundy SM, Brewer HB Jr, Cleeman JI, Smith SC Jr, Lenfant C. Definition of metabolic syndrome: report of the National Heart, Lung, and Blood Institute. American Heart Associ-ation conference on scientific issues related to definition. // Circulation. 2004. Vol. 109, N 3. P. 433–438. 12. Scales CD Jr, Smith AC, Hanley JM, Saigal CS Prevalence of kidney stones in the United States. // Eur Urol. 2012. Vol. 62, N 1. P. 160-165. 16. WHO. Physical status: the use and interpretation of anthropometry. Report of a WHO Ex-pert Committee. WHO Technical Report Series 854. Geneva: World Health Organization, 1995. 452 p.
17. WHO. Obesity: preventing and managing the global epidemic. Report of a WHO Consulta-tion. WHO Technical Report Series 894. Geneva: World Health Organization, 2000. 253 p.
18. Cho ST, Jung SI, Myung SC, Kim TH. Correlation of metabolic syndrome with urinary stone composition. // Int J Urol. 2013. Vol. 20, N 2. P. 208-213. 19. Lee JM, Kim HC, Cho HM, Oh SM, Choi DP, Suh I. Association Between Serum Uric Acid Level and Metabolic Syndrome . // J Prev Med Public Health. 2012. Vol. 45, N 3. P. 181–187. 20. Lee YJ, Cho S, Kim SR. A possible role of serum uric acid as a marker of metabolic syn-drome.// Intern Med J. 2014. Vol. 44, N 12a. P. 1210-1216. 22. Rendina D, De Filippo G, De Pascale F, Zampa G, Muscariello R, De Palma D, Ippolito R, Strazzullo P. The changing profile of patients with calcium nephrolithiasis and the ascend-ancy of overweight and obesity: a comparison of two patient series observed 25 years apart. // Nephrol Dial Transplant. 2013. Vol. 28, Suppl. 4. P. 146-151. 23. Siener R, Glatz S, Nicolay C, Hesse A. The role of overweight and obesity in calcium oxa-late stone formation. // Obes Res. 2004. Vol. 12, N 1. P. 106-113. 24. Taylor EN, Curhan GC Body size and 24-hour urine composition. // Am J Kidney Dis. 2006. Vol. 48, N 6. P. 905-915. 25. Sakhaee K, Maalouf NM. Metabolic syndrome and uric acid nephrolithiasis. // Semin Nephrol. 2008. Vol. 28, N 2. P. 174–180. 26. Eisner BH, Deshmukh SM, Lange D. Struvite Stones. // In: Grasso M, Goldfarb DS (eds) Urinary stones: medical and surgical management. Wiley, New York, 2014. P. 48-56. 27. Saliba W, Barnett-Griness O, Rennert G.The association between obesity and urinary tract infection. //Eur J Intern Med. 2013. Vol. 24, N 2. P. 127-131. 28. Semins MJ, Shore AD, Makary MA, Weiner J, Matlaga BR. The impact of obesity on uri-nary tract infection risk. // Urology. 2012. Vol. 79, N 2. P. 266-269. 29. Ribera MC, Pascual R, Orozco D, Pérez Barba C, Pedrera V, Gil V. Incidence and risk fac-tors associated with urinary tract infection in diabetic patients with and without asympto-matic bacteriuria. // Eur J Clin Microbiol Infect Dis. 2006. Vol. 25, N 6. P. 389-393. 30. Nassaji M, Ghorbani R, Tamadon MR, Bitaraf M. Association between body mass index and urinary tract infection in adult patients. // Nephrourol Mon. 2014. Vol. 7, N 1. P. e22712. 31. Parks JH, Worcester EM, Coe FL, Evan AP, Lingeman JE. Clinical implications of abun-dant calcium phosphate in routinely analyzed kidney stones. // Kidney Int. 2004. Vol. 66, N 2. P. 777-785. 32. Moses R, Pais VM Jr, Ursiny M, Prien EL Jr, Miller N, Eisner BH. Changes in stone com-position over two decades: evaluation of over 10,000 stone analyses. // Urolithiasis. 2015. Vol. 43, N 2. P. 135-139. 33. Голованов С.А., Сивков А.В., Анохин Н.В., Дрожжева В.В. Тенденции распростра-ненности метаболических типов мочекаменной болезни в Московском регионе. 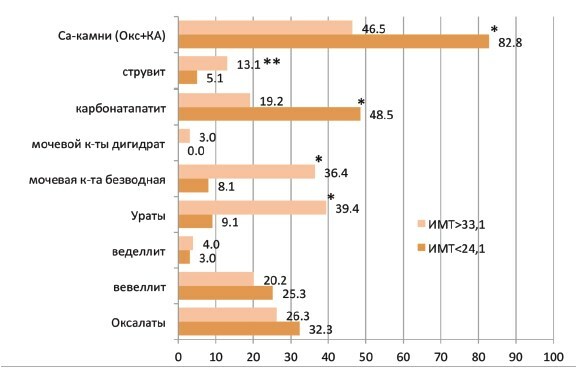 Сравнительный анализ за период с 2010 по 2013 гг. // Экспериментальная и клиниче-ская урология. 2014. N 4. C.54-58. 34. Negri AL, Spivacow FR, Del Valle EE, Forrester M, Rosende G, Pinduli I. Role of over-weight and obesity on the urinary excretion of promoters and inhibitors of stone formation-in stone formers. // Urol Res. 2008. Vol. 36, N 6. P. 303–307. 35. Taylor EN, Curhan GC. Body size and 24-hour urine composition. // Am J Kidney Dis. 2006. Vol. 48, N 6. P. 905–915. 36. Stamatelou KK, Francis ME, Jones CA, Nyberg LM, Curhan GC. Time trends in reported prevalence of kidney stones in the United States: 1976–1994. // Kidney Int. 2003. Vol. 63, N 5. P. 1817–1823. 37. Nowfar S, Palazzi-Churas K, Chang DC, Sur RL. The relationship of obesity and gender prevalence changes in United States inpatient nephrolithiasis. // Urology. 2011. Vol. 78, N 5. P. 1029–1033. 38. Zumoff B, Strain GW, Miller LK, Rosner W, Senie R, Seres DS, Rosenfeld RS. Plasma free and nonsexhormone-binding-globulin-bound testosterone are decreased in obese men in proportion to their degree of obesity. // J Clin Endocrinol Metab. 1990. Vol. 71, N 4. P. 929–931. 40. Otunctemur A, Ozbek E, Cakir SS, Dursun M, Polat EC, Ozcan L, Besiroglu H. Urolithia-sis is associated with low serum testosterone levels in men. // Arch Ital Urol Androl. 2015. Vol. 87, N 1. P. 83-86.